Foodies rejoice: Explore Gwinnett has announced the 2014 restaurants/menus for Gwinnett’s longest running dining promotion, Gwinnett Restaurant Week. Beginning Sunday, July 20 through Thursday, July 24, 2014 deal seekers are invited to enjoy the best dining that Gwinnett has to offer. “This is our 9th year running Gwinnett Restaurant Week and July continues to be a great month to support our locally owned upscale restaurants,” says Lisa Anders, Explore Gwinnett Executive Director. “When visitors travel to Gwinnett, they want to have a dining experience, and enjoy our local flavor. It’s important for Gwinnett to have those dining options and to celebrate them.” Gwinnett Restaurant Week provides the opportunity for diners to enjoy a three-course meal at one 15 participating restaurants for one low price of $21.21, plus tax/gratuity. The average savings per meal is about 30%. Local flavor and farm-to-table are two of the biggest draws for several Gwinnett Restaurant Week participants. Local favorites Graft, Kaet’s Steakhouse and Sperata feature primarily locally sourced food, with rotating menus that focus on what is fresh. “We are also very excited to add two new restaurants to our Restaurant Week portfolio this year – the newly opened 1910 Public House in downtown Lilburn, and the new steakhouse, The Crossing, located in the heart of Historic Norcross. While the word-of-mouth about Restaurant Week drives a lot of traffic, “we have a strong marketing partnership with Yelp OTP this year, and residents and visitors will see Gwinnett Restaurant Week extensively on local media, billboards, social media and foodie blogs,” adds Anders. 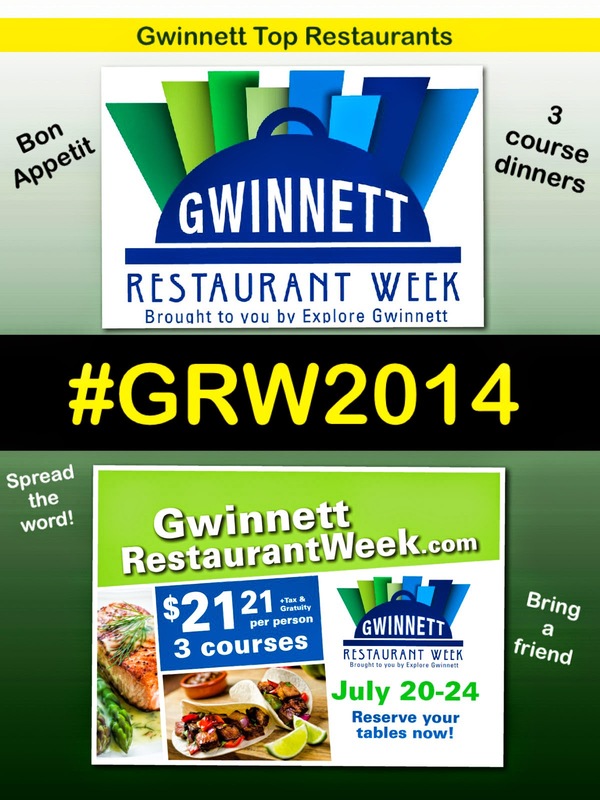 All participating restaurants/menus will be online at GRW’s official website, www.gwinnettrestaurantweek.com. Reservations are required for most restaurants, and are made by contacting the restaurants directly. To view all the menus please go here: http://www.gcvb.org/restaurantweek/GRW_2014_menus.pdf.